Push-to-Talk (PTT) may be nothing new, but Goosetown Communications is innovating how businesses can use PTT, making it accessible and easy to implement. Goosetown’s enhanced two-way PTT radio app called the Goosetown Communicator is our newest tech product. This app is for our customers who want to maximize the communications tools already at their fingertips. The Goosetown Communicator is a free app for iOS and Android systems. The app turns any smartphone into a PTT device. Connect your entire team, regardless of the devices they depend on, using the Goosetown Communicator in conjunction with an LMRS. A land mobile radio system, or a private or public land mobile radio, is for teams on the ground. The types of devices involved with an LMRS include handheld portable radios, base stations, and repeaters. We manage all of this here at Goosetown Communications as part of our Platinum Plus® Managed Services. That way our customers can reap all the benefits of PTT radios and apps without dealing with the tech side of things. The benefits of Push-to-Talk or PTT service over standard cellular starts with the quickness of communication. Your team can communicate with the entire group in a single press of a button. No more making a dozen phone calls, texts, and emails to different group members to coordinate a conference call. In an emergency, time is paramount—our technology responds with expedient connections over a national network. Some industries require workers to have certain types of equipment. Take construction workers that demand hardworking walkies to withstand the rigors of the worksite. Compare these to their managers, architects, and engineers who stick with more tech-centric smartphones and tablets. Everyone must stay on the same page, but communication is tricky without PTT. Our enhanced two-way PTT radio app upgrades basic push-to-talk operations for a more seamless system. Everyone can use their own handhelds, or choice of devices while staying on the same centralized communications network. Employees minimize device overload and stay in contact with the group. It’s a win-win. We feature our Push-to-Talk over LTE service, which is the backbone of the AT&T network. You stay connected over the largest network in the nation. Our app can be downloaded via iTunes or Google Play for iOS and Android. In addition, the LTE Radio G887, which we offer here at Goosetown Communications, is also compatible with the Goosetown Communicator app. If you are in the market for game-changing business communications, consider the options at Goosetown Communications. We offer comprehensive, all-inclusive, white glove service for group communication. If you’re just looking for the lowest price on equipment, it’s not good for your bottom line. You end up frustrated with dropped calls and hard-to-hear connections. Worse, there’s no communication with your equipment supplier. What we don’t do is sell you a bunch of handheld radios and a manual you can read to figure out what to do next. Our goal is total communication services. That includes communication with our customer. If you’re looking for someone who is invested in the success or failure of your radio, Goosetown Communications is your guy. We don’t take your money until your radio works. Period. We make sure you have the tools we promise to provide you. More importantly, we make sure you understand how to use these tools. After all, a push-to-talk device is only valuable when it does the job. The Goosetown Communicator offers the greatest range of PPT service over the AT&T LTE network. With our Push-to-Talk application, you turn your cell phone into a walkie-talkie. A Push-to-Talk app that connects with everyone in your LMR two-way system network. The Goosetown Communicator app lets you get things done faster and more efficiently. Speak to someone instantly across town, across the state, across the entire country We designed this proprietary system to meet the needs of our busy customers. We know you already use a cell phone, so it’s easy to integrate The Goosetown Communicator and connect everyone with one main line of communications. Reliable results. One-touch communication. Stay connected with The Goosetown Communicator, a seamless way for everyone to stay in touch. Your life and the lives of many others may depend on it. This app truly is a game changer for business—your business. Check out some of the features and services that the Goosetown Communicator app offers. How often do you pick up your phone or radio to contact a group of people? For emergency response managers and manufacturing floor leaders, conferences calls are critical and frequent. Stay in touch and on track with real-time, instantaneous communications. Everyone in your network can sign on to a conference call without delay. Those crucial few seconds can be all that matters at the end of the day. Set your team up for success in life-saving missions. Go with Goosetown Communicator for comprehensive access to our Push-to-Talk services. The Goosetown Communicator is a handheld device that serves as a rugged, waterproof Push-to-Talk system. Our latest addition to the line is the Android 5.1 4G R887. For teams that need something more robust, the Goosetown G-887 has got you covered. As a full-service group communications service provider, the company recently rolled out the G-887. This 4G PTT phone is purposely built for push-to-talk communications. No complicated menus, no hard to access buttons, no fragile components to break. The G-887 is waterproof for the ultimate rugged durability in the toughest conditions. 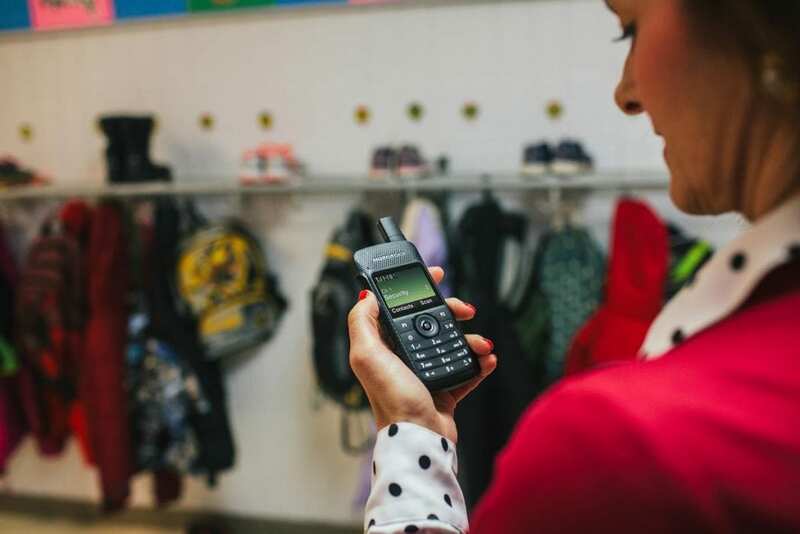 The first purpose-built PTT phone by Goosetown Communications works with the Goosetown PTT app for continuous communications. It features a speaker microphone and carrying case for easy portability, along with a desktop charger and option of enabling GPS. Operating on an Android system, the G-887 is not on a cellular network or compatible with additional apps. It is a straight-forward PPT handheld that keeps your team on the same page with minimal interference. There’s a lot of industries where the day-to-day tasks involve connecting a series of moving parts. Whether you are in the logistics business or working as a fleet manager for a trucking company, you understand the demand for asset security. If your freight load gets stolen, it can cost jobs. Plus, for maximum efficiency and safety, you need to know where your people are. The Goosetown Communications new PPT phone app and G-887 features GPS satellite location tracking technology upon request so you can track your drivers or employees based on location and manage their position. Increase the confidence of your shipping customers by providing them with up to the minute shipment tracking. Manage a lost or missing freight shipment within seconds thanks to satellite tracking using GPS. Today’s trucking and transportation customers expect GPS tracking as part of their services. For transportation managers, GPS and PTT go hand-in-hand. For emergency managers in the police, fire, emergency, and local government, you are responsible for communication during worst-case scenarios like mass emergencies. The most efficient way to do this is by geo-fencing your audience. Send out emergency alerts using GPS tracking so that only those recipients who are within the targeted area receive the message. Eliminate guesswork and mixed messages, increasing public confidence. Keep your emergency notification messages contained and secure by using Goosetown Communications systems. Our communications systems focus on internal communications. We give you tools you need to stay in instant contact with your team using Push-to-Talk handhelds and our app. The importance of cybersecurity and communications is a big deal. It is such a big deal that the US government has an entire department dedicated to it. The Office of Cybersecurity and Communications (OCC) is dedicated to improving our nation’s cyber and communications infrastructure. You don’t need to contact the OCC to handle your cybersecurity with communications. The Goosetown Communicator is your go-to solution for secure communications with a variety of devices. We ensure that your communications will be hacker-proof. If in an emergency your network is jeopardized, we handle the hard parts of regaining your security. Rather than stressing out about maintaining continuity during an emergency, our IT department knows what to do. Thanks to our Platinum Plus® Managed Services we take care of everything involving your group communications. By using our Push-to-Talk handheld devices and PPT app along with our total enterprise solutions, you secure your entire system. From automated emergency response messaging to communicating with the Internet of Things—we provide you with a path to industry compliance. The Internet of Things (IoT) connects all things electric using an Internet framework. It is the way of the future. We are ready to follow suit with group communications systems adaptive to this disruptive technology. Rather than getting stuck in a communications rut, we provide you with resources and technologies needed to move on to the next task of your day. Create your own IoT for communications with Goosetown Communications at the helm. Our technology including the latest, free Push-to-Talk application for iOS and Android is easy to deploy. Your entire team can be on board and ready to communicate effectively with a low activation cost. In addition, you are not bound to a single type of technology or to a single handheld device. Communications technology is evolving rapidly. Your business cannot afford to use last decade’s portable radios or technology that is going obsolete. But it’s important to make informed decisions on your communications systems. If you purchase new communications equipment every time there’s an advancement in technology, your business would go belly up in no time. Strike a balance for your business—and your budget. Go with the experts at Goosetown. Get on board with in-vehicle radios, body-worn cameras, or MOTOTRBO systems. Call Goosetown and receive our full service, white glove approach. Go with the latest and most up to date handheld devices for your communications needs. At the same time, you don’t have to pay to replace old units either, we’ll take care of all of this for you. Save time, save money, save yourself a headache—and go with Goosetown Communications. Severe weather is a growing concern for companies all over the US. You must be able to protect your business from the threat of flooding, hurricanes, tornados and other natural disasters that can claim lives and cost billions. You don’t need to live in Tornado Alley to understand the threat of seasonal change. If you are trying to maintain communications during bad weather, you need more than just a business continuity plan. Be proactive with choosing the best real-time enterprise communications by Goosetown Communications. Prepare your team to access contacts and group lists thanks to cloud storage using the Goosetown Communicator. All your info is saved far away from the storm site. This will protect your company from onsite server damage due to severe weather. Why does this matter? Let’s say you are like a lot of traditional businesses or organizations, and you have your computer servers on location. These servers handle your computer information and data. This includes your contacts and group lists for emergency communications. It also includes all your team’s records pertaining to previous emergency situations, such as the Bad Storm of ’96 or the Big Fire of ’00. This data is critical for your team or company to provide their best services. More importantly, when it comes to dealing with an emergency, you need to have immediate access to this data. Without your contact lists, your communications are shut down. Utilize Goosetown Communication’s enterprise communications app that works with your offsite, cloud-based system. That way your business can stay up and running with minimal interference during the worst of weather. Your customers or community members alike will appreciate the forward-thinking. Your team will be glad to have a way to stay connected in inclement conditions. What happens when your team is dealing with an F-5 tornado or a hurricane the size of Harvey? As soon as the mad panic of mass evacuations begin, all the nearby cell towers will be jammed up. If you do not have a solution for communicating in place, you are in trouble. The only way emergency crews can battle stormy situations is to have a no-fail plan for staying connected. This starts by implementing the right system with value-added features including the Goosetown Communicator app. Our app along with the G-887 will set your group up for instant and reliable communications, which is exactly what you need in this type of scenario. Another increasingly, and frighteningly, common emergency in schools, churches, hospitals, and military offices in the US, are active shooter events. These terrifying scenarios happen within minutes yet ruin the lives of many…for years to come. If your place of business is the site of an active shooter, you must be prepared to handle this unexpected situation. The thing is, any site is susceptible to active shooter threats and workplace violence. In response, if your company does not protect your employees from an active shooter scenario, you could be fined during an audit of the event thanks to the General Duty Clause of the Occupational Safety and Health Act of 1970. This includes providing successful communication internally and externally. More importantly, if your organization is involved in fire, emergency rescue, or 911 services, then having an effective communication system in place is mandatory for your mission. Getting ahead of an active shooter scenario by as few as five seconds can save lives. In fact, most active shooter events are over in just 19 minutes, with most of the damage happening in the first 10 minutes. Your response team does not have minutes to spare when it comes to deciding a plan of action in an active shooter situation. Implement Goosetown Connector’s Push-to-Talk over LTE and be ready. Have your mass communication system in place to notify all necessary parties immediately. There are no delays when it comes to active shooters. Act accordingly with the Goosetown Communicator app and G-887 PPT handheld device. One of the oldest problems we face in society is a lack of communication. Just ask your spouse or significant other. They will agree with you, for once. Being unable to communicate is not just a relationship issue. Teams in the oil and gas, healthcare, trucking, and education sectors all have this problem. Fortunately, there is a solution staring right back at you. Goosetown Communications provides wide area radio communications for all these industries. We provide you with instant communications. Talk to your entire team at the touch of a single button. We give you coverage anywhere via our vast selection of radio devices and cell towers. We provide each of your team members with the best handheld mobile device for their communications needs and work environment. If at any point your handheld devices are not working, we fix them efficiently and keep you communicating with a temporary device or setup to reduce your own service disruptions. Leave it to the experts and let us handle your communications problems today. Get the Goosetown white glove approach and focus on what matters most in your life—your business. Goosetown Communications has been serving the Northeastern US as the leading provider of communications systems since 1990. We are based in Congers, New York and have an office in East Hartford, Connecticut serving our New England customers. What if you could get all of that by going with a single communications provider? Well, you can, when you opt for Goosetown Communications. We offer a multifaceted approach to communication for customers in New York and Connecticut. Does your business demand instant communication? To give our customers full service throughout the nation, we have extended national two-way communications. You get access to more than one system ranging from our area-wide Push-to-Talk app to our line of land mobile radio systems (LMRS). In fact, we have the largest UHF digital trunking system in the Eastern US. Are you interested in increased safety in the workplace? Keep your workers safe. Keep your customers safe. And make OSHA happy. Choose a communication system that ensures your workers have a way to stay in contact in an emergency. No more slip and fall incidents caused by a lack of communication. No more employees left unassisted, calling for help is one-touch away. Keep your worksite secure by staying on top of communication. Tired of losing coverage and dropping calls? Whether you work in the oil and gas industry, or the transportation and logistics sector, travel is a primary part of the job. Ensure your channels of communication remain open always. Stay available for your team and be there for your workers when they need you. You must be able to communicate with workers across thousands of miles in an instant and cell phone access is spotty in isolated areas where oil and mining are conducted. At the same time, truck drivers hauling freight throughout the Western US or in mountainous regions can go for hours without having cell phone service. Yet if you need to contact these workers, time is of the essence and communication is mandatory. We work in a globalized economy, and spotty cell phone service is no longer acceptable. Provide your customers and clients with the communication they expect. Imagine giving a warehouse worker or forklift operator an iPhone for their work device. Here’s a guess that the iPhone didn’t last a week. Those phones are not made for rugged work environments. Glass touchscreens have a place, but this is not in the hands of a construction worker wearing gloves. Give your workers the right way to communicate. Make their lives easier by letting Goosetown take the guesswork out of this process. After almost 30 years, we know what kind of handheld devices are best for the job at hand. Rugged devices like the G-887 hold up to tough environments while an app on an iPhone for hospitality workers provides convenience. We save you the trouble of testing and failing by recommending industry-tested and worker-approved portable radios. Our approach to handling communications services at Goosetown Communications is a game changer for your business. We start by choosing the right type of system for your company. Learn more about the differences in what we call carpeted and non-carpeted spaces in the group communications industry. We work with businesses that have carpeted, and non-carpeted environments. In fact, most businesses have each type of setting and need tools dedicated to each employee depending on their role. A carpeted work environment is a workplace that is indoors in a regulated environment, like an office. Here you have workers who focus on ergonomic solutions like sitting correctly in front of a computer screen or choosing a phone headset that is easy to access on a regular basis. In addition, employees in a carpeted environment may need more than one way to communicate. Typically, communication is cellphone-based, however, depending on the type of business, like a warehousing operation, you may also need portable radio communications. This is where non-carpeted work environments come into the picture. Here you have the rugged, outdoor setting, such as a construction site or oil rig. Communication devices are simpler and more straightforward. You see portable radios that can be used along with hearing protection or while wearing gloves. Portable radios in this type of environment need to be rugged and dependable, with waterproof and shockproof features. Your goal is to find a common ground for your communications solution. Do you need carpeted or non-carpeted solutions? If you are unsure, or you need a combination of the two, Goosetown Communications offers the total package. Let us help you get the best portable radios or applications for your communication needs. Allow our team to handle all service, maintenance, and repairs with nothing extra from you including cost. Note that this is not your typical touchscreen cellphone. The Goosetown Communicator is constructed to last in the toughest work environment. Whether you work in outdoor environments prone to rain or around aquatic spaces, you’ll appreciate having a 100 percent waterproof device. Being able to do more with a handheld device is equally important. The Goosetown Communicator is set up with a front and rear facing 8-megapixel camera to give you optimal video and photo capabilities. Capture the scene of a crash, the sound of an interview, or the recording of a special work event—all using your Goosetown Communicator. Audible alerts is another area that demands power on certain types of worksites. For those worksites that require hearing protection, such as heavy hauling sites or coal mines, you need to be able to hear your handhelds. Check out the double loudspeaker feature available on the G-887. You won’t find that on your daughter’s iPhone. In addition, there is a second speaker on the side of the device for added auditory power. The main feature of the Push-to-Talk G-887 has to be the PPT button and setup. Right within your fingertips, literally, is the PPT button on the side of the phone. Never fumble with finding that home screen button again. Forget taking off your work gloves to send out an emergency alert. Punch that PPT button and instantly connect with who you need to now. Other buttons that make the G-887 rugged worksite ready are the Navigation Key, Menu, and Back buttons. Instead of waiting for the screen to light up, you just have to push the button. Imagine that. It truly is ideal for workers who need to be able to push a key without having to take the time to find it. Often times these workers don’t have that time or capability. Being able to feel for the PPT button without a thought makes this a seamless process. Those seconds can best be used doing other things. Goosetown knows it and gives them back with the Goosetown Communicator and our new PPT app. If you are looking for a device to replace your cellphones with broken screens, then go with the Goosetown Communicator. If you need a PPT device that has an integrated app and communications platform, forget the radios. Opt for the G-887. If you already have a well-designed portable radio, such as one of the Motorola digital radios we carry, that’s great. We can work with you by providing your team with our PPT app available on iPad and iPhone. Need portable radios for an upcoming trade show? Looking for waterproof handhelds for a pool cleaning company? Searching for an all-inclusive one-stop-shop for your communications needs? Goosetown Communications is the largest radio network operator in the Northeastern US. We provide total communications services from the truck cab to the control room. Our technologies extend from cell phones and portable radios to desk phones and computers. Goosetown gives your company all of the tools you need to communicate effectively. In addition, we manage all of our radio installations and repairs, as well as outfitting public safety vehicles and complying with FCC licensing. As a full-service group communications provider, Goosetown Communications solves your communications problems with high-tech solutions.